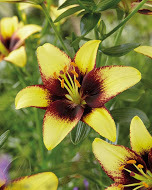 BumbleBee Lily has a rich burgundy center with speckled and fringed yellow petals and sepals. Capable of stinging the senses. 3 12/14 bulbs/pkg.